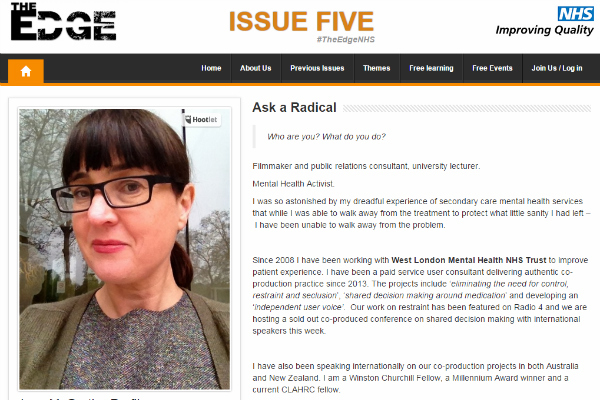 Jane McGrath, MFHT, writes about The West London Collaborative – an initiative inspired by her own experience of secondary care mental health services – in Issue 5 of The Edge, from NHS IQ. Since 2008 I have been working with West London Mental Health NHS Trust to improve patient experience. I have been a paid service user consultant delivering authentic co-production practice since 2013. The projects include ‘eliminating the need for control, restraint and seclusion’, ‘shared decision making around medication’ and developing an ‘independent user voice’. Our work on restraint has been featured on Radio 4 and we are hosting a sold out co-produced conference on shared decision making with international speakers this week. Posted on 9 February, 2015 by Federation of Holistic Therapists (FHT). This entry was posted in news and tagged news. Bookmark the permalink. ← What’s really in your healthy breakfast?